The black version of the Black Knight Ion X-Force is just a few grams lighter than the yellow version for players liking a bit more maneuverability in their shot making. Features: Power of 6 - frame is measured at 6 points during processing for optimum density, flex and balance NCT - Nano Crystalline Technology Thermal Core technology 16K - Hyper tensile fibre XMG - Extreme Modulus Graphite Strung with Ashaway Supernick XL Micro Best suited for intermediate to advanced players. 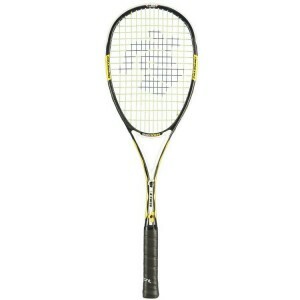 RACQUET COMES FACTORY STRUNG WITH ASHAWAY SUPERNICK XL MICRO. NO COVER INCLUDED.